An incredible Oregon adventure! The famous river trail along the Rogue River is considered to be one of the greatest North American hiking trails. Historical sites abound along the Rogue River trail and our trip visits them all. Each footstep is greeted with picturesque vistas of wildlife and nature. You visit glistening waterfalls, cross babbling brooks and gaze upon deep, rugged canyons. On this lodge-to-lodge hiking adventure, there are breathtaking views around every bend. Imagine hiking through a wilderness with only a light daypack. Our rafts carry your gear leaving you unencumbered and free to discover some of America’s finest wilderness – the Wild Rogue Wilderness. After a rewarding day filled with the fragrance of pine, oak and madrone forests you arrive at a riverside lodge where a hot shower and a comfortable bed await. After settling into your room, we serve scrumptious hors d’oeuvres followed by a delicious dinner. Then there’s time to remember the highlights of the day and share a few tall tales under the stars. We offer our Rogue River hiking trips in the late spring and early fall (our fall trips are camping vs. lodge-to-lodge). These are times of year when the air may be a bit chilly for rafting but are ideal for hiking. Spring trips enjoy the abundant wildflowers blooming throughout the canyon. Side creeks run full and waterfalls dance over moss-covered rocks. The forest is alive with the joy of spring’s awakening. Spring or fall, our pace is casual and allows plenty of time to pause and relish the verdant beauty that is everywhere. Along the way, our knowledgeable guides tell you about the history, flora, and fauna of the canyon and forest. Each day we walk between five and 15 miles on a trail that roughly parallels the river. During the 40-mile hike total elevation drop is just over 200 feet, so the overall hike is very slightly downhill. This hike is suitable for anyone in reasonable shape that can hike 10-15 miles per day. Because our rafts carry your overnight gear and other trip supplies, you carry only water, an extra layer of clothing and perhaps your camera and binoculars. If you get tired and want a change of pace our raft isn’t far and you can hop aboard to be carried down the river. Each day our raft arrives at the evening’s lodge a bit ahead of the group so your gear is ready to be carried to your private room for the night. See our Rogue River rafting trip for details about our lodge-to-lodge raft adventure. Travel to Merlin, Oregon and meet your Team Leader at Morrison's Lodge at 5:45pm PST for a one-hour orientation meeting to answer last-minute questions. You'll also receive your waterproof gear bags. Dinner is on your own. On the first day of this Oregon Adventure, our lead guide meets hikers at 8:15 a.m. the morning of the hike at Morrison's Lodge. Once everyone is greeted and, given directions on where to park their vehicles, the lead guide gives a short description of the hike. Hikers then step into a Lodge van and are transported to the hiking starting point: Graves Creek. The first day, we hike about 9.6 miles to Black Bar Lodge. We stop for a riverside buffet lunch along the way, often near the Tyee Rapids camp site. One of the highlights of this Rogue River hiking trip is the many historic sites along the way. Our guides are natural story-tellers and will make your trip more rewarding with their stories about these sites. In the spring there are also dozens of wildflowers in bloom in the Rogue River canyon and viewing them is fascinating. After lunch we continue along the gentle Rogue River trail to Black Bar Lodge. As you hike, one of our guides provides raft support for the hiking group and upon arrival at Black Bar, will row over and get the group and transport them to the other side of the river. Hikers arrive at Black Bar Lodge late afternoon and the lodge staff assigns double-occupancy cabins. There’s time to freshen up before the evening’s hors d’oeuvres are served. We focus on locally-sourced foods, Oregon wines and beers as well as other beverages. Dinner is generally around 7 pm. Since the lodge is run by a generator, lights go out at 10 pm and back on the next morning at 7 am This makes for great star gazing and a peaceful, quiet sleep. Oregon adventurers wake up and the Black Bar Lodge serves a country breakfast around 8:00 a.m. After that there’s time to pack up before walking back to the river and crossing over to the trail. Today’s hike covers a little less than 15 miles on a gentle trail. Again, some of the fun on the Rogue River trail is the many historic sites along the way and beautiful vistas of the river. After working up a good appetite, we serve the hikers a bountiful riverside lunch, usually at a place known as Battle Bar. Refreshed and re-energized, we continue hiking downriver to Marial Lodge, arriving late afternoon. Again, cabins are assigned, there’s time for a shower or other relaxing and then hors d’oeuvres are served. Dinner is served around the classic round tables of Marial Lodge. After dinner we offer a short hike to enjoy the soft summer light and spectacular views of the river canyon. Evening is a good time for wildlife viewing as well. The power generator is never turned off at this lodge so there is power available all night. We gently wake you around 7:30 a.m. for breakfast. It’s a casual pace though as today’s hike is just under five miles. Our destination is the Rogue River’s own Paradise Lodge. Since this is such a short hiking day, anyone who wants will head back upriver to the Rogue River Ranch which is a museum and interpretive center. After the visit and imaging what pioneer life in the canyon must have been like, we head back downstream, stopping for lunch at Marial Lodge. Then we continue on to Paradise Lodge. Our Rogue River hikers arrive at Paradise Lodge by mid-afternoon so there’s plenty of time to enjoy the expansive lawn and maybe have a game of Frisbee or sit and watch the river go by. As the afternoon sun sets hors d’oeuvres are served along with the usual selection of beverages. Then it’s a nice dinner and time to sit on the deck and watch the stars and share stories of the day. Again, there is power all night long at this lodge. We wake you a bit earlier today around 7:00 a.m., enjoy a leisurely breakfast and then get back on the Rogue River hiking trail. About 6.5 miles later we reach Flora Del and have lunch. The river canyon has widened here and on a hot day you might enjoy a dip in the river. After lunch, we either hike another five miles, or climb aboard our rafts to be transported to the take-out point, Foster Bar. We try to arrive by early afternoon, around 1:30 or 2:00 pm and then load up into vans to return to Morrison's Lodge. The drive takes about two hours and is a winding and scenic road through the mountains. ROW Oregon, LLC, doing business as ROW Adventures is proud to be an Equal Opportunity recreation service provider. ROW Oregon, LLC operates under special use permit from the Bureau of Land Management, Medford District along with the U.S. Forest Service in Siskiyou National Forest. All our operations and facilities are operated on a non-discriminatory basis. Prices are based on double occupancy in the lodges. There are limited rooms available for groups of 3 if all are willing to share the same room. These will be available for first come, first served. If an odd number of guests, there is a single supplement fee of $600 for 4-day adventures. Private trips availble for 1-23 guests: Pay for 19 spaces and get the 20th space free. Why go with ROW on the Rogue River? You stay in the best-located lodges along the river including Black Bar and Marial providing exclusive accommodations for our groups. Few outfitters can offer a pure lodge-based trip and many have to camp the first night of the trip because they don’t have the established relationships that we do. Itinerary is designed to visit many different points of interest, taking advantage of all the sites the river offers. We visit the historic Zane Grey cabin (the author who invented the genre of literature known as the “Western”), other pioneer homesteads including the Rogue River Ranch, Whisky Creek cabin and many natural wonders in the river canyon. Your trip is led by knowledgeable guides who share the Rogue River canyon's natural and cultural history. Only ROW Adventures specifically trains our guides in this area and most are Certified Interpretive Guides through the National Association for Interpretation. 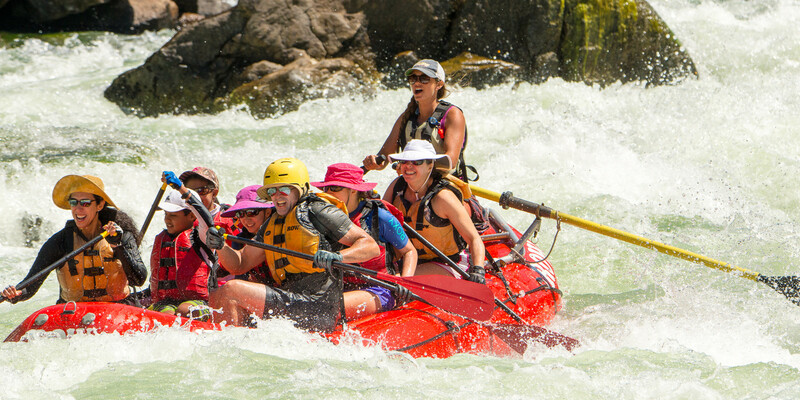 On our Rogue River camping trips, ROW guides split into two crews once you reach camp - one will prepare delicious meals and appetizer for you; while the other is available to lead hikes and other activities from camp. The guides enjoy sharing conversation and laughter at meal times and on into the evening. Simple logistics are easy whether you are flying or driving into the area. Your choice of river craft – since everyone has their own idea of excitement, we bring a variety of river craft for you to enjoy. In addition to your hiking boots; if you choose to enjoy the river ROW provides crafts including oar rafts, paddle rafts and inflatable kayaks. ROW Adventures has over four decades of experience and is an award-winning outfitter in business under the same ownership since 1979. We augment the lodge’s meals with our own delicious hors d’oeuvres and fine regional wines such as Oregon’s famous Pinot Noirs as well as Oregon beers from various craft breweries. We offer a number of unique specialty trips such as our culinary Rogue River trips, wine-tasting, River Soul Journeys and more. Complimentary beer, wine, juice and soda, all in moderate quantities, is provided. We are proud to serve fine local Oregon and Northwest wines. We always have plenty of ice! How do I get to the Rogue River? If You Are Arriving by Car: From I-5 (north or south) take Exit 61 to Merlin. Merlin is 3 miles west of I-5. Turn left (west) onto Merlin-Galice Road and go 12.5 miles. You will cross a large, yellow bridge over the Rogue River about two miles before you reach Morrison's Lodge, which will be on your right. If You Are Arriving by Air: The nearest airport is located in Medford, Oregon – the Rogue Valley International Medford Airport – which is approximately 28 miles south of Grants Pass. United, United Express, Horizon/Alaska and Delta Connection service this airport. Shuttle service can be arranged from the airport to your accommodations in Grants Pass or Merlin. This shuttle can also pick you up at Morrison's Lodge the afternoon you return from the river and return you to the airport (or to your accommodations if your flight is not until the following day). For assistance with shuttle service, call Galice Resort at 541-476-3818. If you are staying at Morrison's Lodge you may utilize their shuttle service and you can reach them at 541-476-3825. Please note: The fees that these shuttle companies charge are in addition to your trip fees. Private aircraft can fly into Grants Pass, Oregon Airport-FAA identifier, 3S8. The airport is 5 miles from Grants Pass and about 20 minutes from our put in site at Rand Boat Launch. What area lodging do you recommend before or after the trip? Whether driving or flying, we encourage you to arrive in the area the night before your trip. There are a number of motels and campgrounds in the area and reservation are strongly recommended. The following lodge and motels are easy to find. Where do we meet for the trip? We will meet you at Morrison's Lodge near Merlin, Oregon at 5:45pm the evening prior to your departure date for a one-hour orientation meeting to answer last minute questions and give you your waterproof bags to pack. This is an important meeting so please be on time. The next morning, we will meet you at 8:00am at Morrison's and transport you to the launch point of your trip. Please have breakfast on your own before we meet. Lodge-to-lodge rafting trips: Return to Morrison's around 5:00pm on the final day. Camp trips: Return to Morrison's around 4:00 pm on the final day. The return trip to Morrisons Lodge is a scenic 2-hour van shuttle (this shuttle is included in your trip fees) back over the mountains. Weather in any river canyon can vary widely day to day. However, the Rogue’s typical daytime temperatures for our early and late season hiking trips can have temperatures ranging from 50-70. While blue skies & sunshine are predominant, rain can happen any time so please bring rain gear! Tell me about your meals? You won’t have to worry about going hungry on our trips. We feed you from lunch the first day through lunch the last day. The food is fantastic (even if we do say so ourselves), and there is plenty of it. While we provide a modest amount of beer and wine, you are welcome to bring additional beer, wine, soda or other refreshments. We ask that beer and soda not be in glass containers.If you have special dietary needs (ex. vegetarian, allergies, etc.) we can accommodate these easily on camp trip. Just complete the section regarding dietary needs on your trip application form and we will be prepared for your arrival. Please note on lodge trips the lodges provide meals from a set menu, therefore they may not be as flexible. If you would like to discuss your specific needs with an Adventure Consultant please feel free to give us a call at 1-800-451-6034. I have a medical condition. Will this be a problem on the trip? ROW Adventures is able to accommodate people with physical limitations, disabilities, and medical conditions; please speak with your Adventure Consultant if you have questions or think you will require any additional assistance while on the trip. . If you use medications it is recommended to bring two supplies packed in separate, watertight containers. If you carry an insect sting kit, be certain to bring it in your day pack. If you use a CPAP machine, please note that the first lodge, and third lodge DO NOT run their generator all night. If it is critical that you use a CPAP, please plan ahead and purchase an independent battery pack. You can find these at www.cpap.com. How can someone reach me in the case of an emergency? For all intents and purposes, you will be unreachable while on the river. However, give our office phone number - (800) 451-6034 - to the individual(s) who would be responsible for notifying you in an emergency. While we cannot guarantee we will be able to contact you, we will use all our resources to reach you. Our office hours are Monday through Friday. Should we tip the guides and lodge staff? We are very proud of our guides. Their hard work, dedication, river knowledge and attention to detail truly sets them apart from the others. If you feel your guides have gone above and beyond the call of duty in providing you with a very special trip, a gratuity may be left at the end of the trip. You can leave the tip with the team leader. He/She can be counted on to share the trip with all the trip guides. A tip ranging between 7-12% of your trip cost per guest is typical. The same applies for the lodge staff at the lodges where you will be staying. If you feel that you have been well served, we recommend a $5.00 per guest gratuity be given to the staff after breakfast each morning. Your reservation is confirmed upon receipt of a $400 per person deposit which is on a first come, first served basis. The balance is due 60 days prior to the launch date of your trip by check. If final payment is not received when due, we reserve the right to regard the reservation cancelled. Should you have to cancel your Rogue River rafting trip plans, deposits are non-refundable. After the final balance due date, all payments become non-refundable. Alternate guests are welcome. Please understand that we cannot ensure your investment in river trip reservations. We strongly recommend the purchase of trip cancellation and interruption insurance. Once you sign up, we lose the right to sell your reserved space to other individuals or groups. Our number of trips and spaces per trip are limited by river management plans. Therefore, we regret that we cannot make exceptions for personal emergencies. Should you decide to cancel your trip with us, your trip cost is not transferable to another year. Cancellation and interruption insurance can include full refund should you cancel due to health, medical, or several other reasons. If you cannot afford to forfeit your reservation investment, you should purchase trip cancellation insurance. You can purchase this coverage by completing the credit card authorization form and/or by calling our office and we can assist you in the purchase of this insurance. What do I need to do to plan my trip with you? A) First, call or email our office to check current availability and choose a date. Our Adventure Consultants are happy to help you through the entire process. It really is quite simple. B) Once a date has been chosen we will email or mail you a complete reservation packet. A deposit is due within 7-10 days and will confirm your space(s) on the trip. C) Next, you will want to make reservations for your lodging the night before your trip with us. D) Lastly, if you are flying, make your airline reservation with your travel agent (we can help you pick the best times to fly in and out). You will also need to coordinate a separate shuttle to take you to and from the airport. The fees for this shuttle are in addition to our trip fee but our Adventure Consultants are happy to assist you in coordinating with a shuttle service. And, that’s it! Of course, we accept personal checks and money orders but we also accept all major credit cards (Visa, MasterCard, Discover and American Express) for the deposit. We require the final balance to be paid by check. Our prices listed are cash rates. If you wish to use your credit card the final payment amount is subject to a 3% administration fee. What is the degree of difficulty for this hiking trip? The trail is well maintained and in good condition during the spring and early summer. Elevation of the trail is below 1,000 feet. Grades are mild. Much of the trail is level or nearly level. A small portion of the trail is cut into rock cliffs with exposed drop-offs. The trail follows the river, sometimes near the river, other times higher up. The average distance covered each day is 10 miles; varying from 5-15 miles. This distance is a moderate walk for person in good physical condition, provides reasonable time during the day for viewing the surroundings, photographing wild flowers, and a leisurely lunch. Daily mileage: day one 9.9 miles; day two, 14.5 miles; day three, 8.4 miles; day four, 7.8 miles. Participants should be in reasonable physical condition and experienced at walking the distances involved while carrying a light pack. The most frequent problem encountered is sore feet; this can be avoided by walking during the winter and early spring to strengthen your feet. If you have any medical conditions which might affect your ability to engage in this level of sustained exertion please consult your physician. This trek is in a remote area, emergency evacuation would be difficult, and might involve a delay of several hours, or more, to reach medical care. Bring any medications you may need with you. If you do not own trail boots it is a good idea to note the following specifications – buy your boots long before the trip. Wear them as much as possible to break them in. Well designed boots, well broken in, and in good condition are the key to enjoying this trip. Good ankle support is important. Light trail boots are adequate and should have lug soles. Tennis shoes, sandals, and other light weight shoes should not be worn on the trail. A handy trick for insuring foot comfort is carrying a spare set of socks for the day. At lunch time you can change socks. Dry socks at mid-day will go a long way toward keeping tender feet in good condition. Please keep in mind that you will be required to ride in a raft to cross the river at Black Bar Lodge as well as at the end of the trip. You will need to bring along a pair of shoes that you do not mind getting wet. Clothing should be loose fitting and allow full movement. Cotton-polyester blends are cool and dry fast. Bring shorts and long pants as you see fit... and a wide brim hat. You will need clothing for the trail and for the lodge. Rain gear is required. Your daily clothing will be carried in your pack. Extra clothing, personal items and lodge clothing are carried in a waterproof river bag on the raft. Space is limited so keep your gear to 30 pounds or less. The key to a good pack is comfortable and well designed shoulder and waist straps. Even a light pack can be irritating if it doesn't ride well on your back. If you carry your water bottle in the pack, get one with an outside pocket on the side of the pack and large enough to carry your water bottle (your water bottle should be at least one liter capacity). Be certain that the straps and waist band have enough adjustment to allow the pack to be worn over your warm clothing; some inexpensive packs have very short straps. If you will be buying a pack for this trip be certain it is large enough, but don't go overboard. After reviewing the gear list, make a pile of everything you need to carry in the pack, box it up, and take it when shopping for a pack. This is the best way to size a pack.